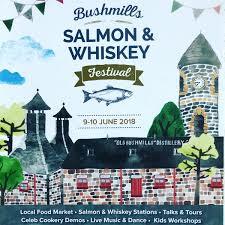 An entertaining upcoming event is the two day Bushmills Salmon & Whiskey Festival at the Old Bushmills Distillery on 9th – 10th June 2018. Opening times Saturday 9th June 11am – 5pm and on Sunday 10th June 1pm – 5 pm. This event celebrates the Old Bushmills world renowned distillery, established in 1608. One of the main salmon nurseries in Northern Ireland is on the River Bush – hence the festival name. The Bushmills Distillery uses triple distillation and two kinds of malt, one unpeated and one slightly peated. They produce three single malts a 10 year old, 16 year old and a 21 year old. In addition there is a 12 year old distillery reserve which is sold exclusively at the distillery. This is the opportunity to purchase this 12 year old distillery reserve by attending this special event. The Bushmills Salmon & Whiskey Festival was established to celebrate the local heritage, culture and the amazing local produce. The 2 day event showcases the arts, food and music, incorporating whiskey tasting and learning how it is made. In addition, the festival features cookery demonstrations by a celebrity and local chefs using locally sourced produce. Celebrate the live music, dance troupes, street performers, salmon station and whiskey distillery tours and much more. Lonely Planet has voted Belfast and the Causeway Coast of Northern Ireland the Best in Travel 2018 and with very good reason. There is a lot to do and see. Largy Coastal Apartments is an ideal location to explore the Causeway Coast. The apartments are only an hour along the scenic Causeway Coastal Route to the Bushmills Distillery. 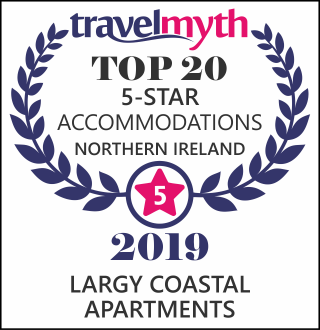 The self-catering apartments, in Carnlough, are five star rated with large lounge areas and bedrooms which provide magnificent sea views. 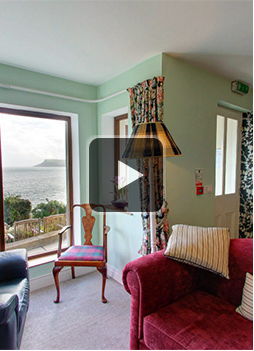 All bedrooms are en-suite with shower and bath facilities and stunning sea views from the living area and bedrooms. In addition, Largy Coastal Apartments have a luxurious outdoor hot tub with equally stunning sea views. The hot tub accommodates up to six people. It is situated next to a log cabin where you can relax with breath-taking views over the coast and the North Channel. Carnlough is situated on the beautiful Antrim coast. It has a picturesque harbour on the shores of Carnlough Bay, at the foot of Glencloy, the second of the nine Glens of Antrim. In addition, Carnlough Harbour was one of the filming locations for Game of Thrones.